It’s that time of the year where everything pumpkin pops up, including this Instant Pot Pumpkin Cheesecake recipe. It seems like as soon as the kids head back to school there is a large presence of pumpkin spice lattes, pumpkin donuts, and pumpkin everything on television and in the stores. Instant Pot Pumpkin Cheesecake with a caramel topping. Just walk by any Starbucks and you will see large posters of the newest variety of a Pumpkin Spice drink hanging on the windows. And if you dare to go in a donut shop, there will surely be a pumpkin spice donut or two calling your name. 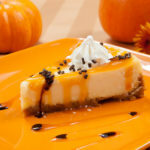 But for me, the one thing I look forward to the most in pumpkin form is cheesecake! There is just something so delicious about creamy pumpkin puree mixed with the cream cheese filling that makes my mouth drool. 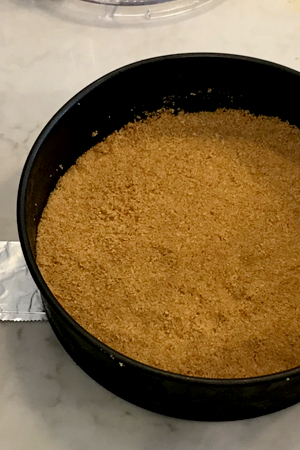 Be sure to smash pumpkin spice graham cracker crust down so that it is firm. And the graham cracker crust is to die for! Graham crackers mixed with a little sugar and pumpkin pie spice that finishes off each bite that you take. Oh, and don’t forget – the optional (but really is it?) caramel or chocolate topping! The topping alone on the Instant Pot Pumpkin Cheesecake is enough to send your taste buds over the edge! So many people ask me about the details of making cheesecake in the Instant Pot. Why bother? A push measuring cup is perfect to measure the pumpkin without making a mess! 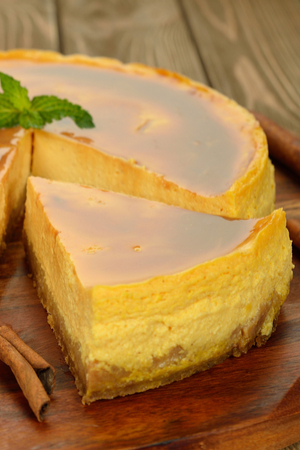 There are so many reasons that Instant Pot Pumpkin Cheesecake, and all other cheesecakes, are so much better when made in the pressure cooker. First of all, there is no need to heat up your oven. Even October days can be quite warm, and therefore heating up the kitchen should be avoided whenever possible. Second, the cheesecake turns out creamy and with no cracks or drying out. The moisture in the Instant Pot allows the cheesecake to maintain a smooth texture that every cheesecake deserves. Plus, during the cooking process, there is no worrying about opening the oven door to check on how the cheesecake is doing. Instant Pot Pumpkin Cheesecake is a just fix it and forget it dessert. When the time is up, the cheesecake is done and ready to cool. However, in order to have a professional looking cheesecake, there are a couple basic steps to note. 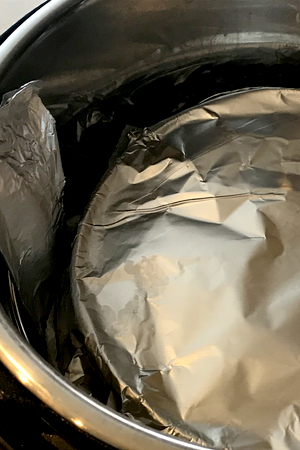 The cheesecake was carried out of the Instant Pot with the foil sling. 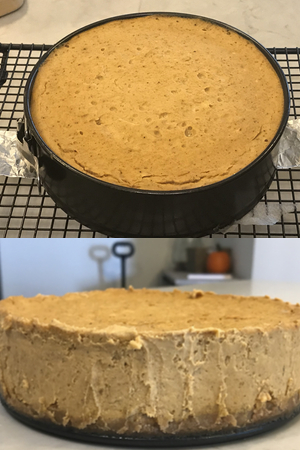 Bottom picture – when the cheesecake has cooled remove it from the pan. First of all, use a 7 inch spring form or push pan for this recipe. This recipe was tested in the Instant Pot 6 quart Duo and with a 7 inch spring form pan. If you use a smaller 6 inch pan you will need to add an additional 10 minutes of cooking time. Most 6 inch spring form pans are deeper than the 7 inch pans and therefore take longer to cook. However, if you are using the 8 inch pan that fits down in the 8 quart Instant Pot, you will most likely need less time for the final product to be cooked. When mixing your batter it is EXTREMELY IMPORTANT to not over mix the eggs. You just want to incorporate them in, not scramble them. If you over mix the eggs in the batter, your cheesecake will not set up properly. Use a silicone spatula to fold in the eggs after you have pulsed them with the food processor just 2-3 times. And when ready to cook make sure you cover your batter and pan to prevent moisture building up and sitting on top of the cheesecake. Cover the top of your pan with a paper towel and foil to prevent excess moisture from entering. The best way to do this is to add a paper towel over the pan and then add a layer of aluminum foil. The paper towel will soak up the excess moisture and the foil will prevent condensation from dripping on top. Once the cooking time expires, allow for a natural pressure release. The cheesecake will continue to set as the pressure begins to release. Allow for another 10 minutes of rest time on a cooling rack once you take it out of the pressure cooker. 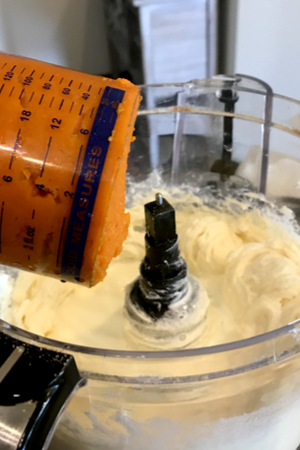 You will know if your Instant Pot Pumpkin Cheesecake is fully cooked if the center core, about 1 inch in diameter, jiggles slightly when you shake the pan. If there is a larger circumference that jiggles or if it looks like the center is completely wet, the cheesecake will need more time to cook. As with all pressure cooked foods, the time will need adjusted based on your altitude. This recipe was tested at sea level. There are a couple more hints that will make your life easier. Use the bottom of your pan to draw a circle on parchment paper. Cut it out and put it on the bottom for easy clean up later! Spray your pan with cooking spray before adding your batter. Even better – line the bottom of your pan with parchment paper and then spray it. This will help prevent the crust from sticking when you go to slice your cheesecake. And finally, make an aluminum foil sling. It only takes a minute and will make taking the pan in and out of the Instant pot a breeze! Creamy and delicious pumpkin cheesecake on top of a pumpkin spice graham cracker crust that is perfectly made in the Instant Pot. Line the bottom of your springform or push pan with parchment paper. Spray both the sides and parchment paper lined bottom with baking spray. Add 1 ½ cups of water in the liner of your Instant Pot. Place the trivet on top of the water. Break up each graham cracker into 4 pieces and place them all in a food processor. Add 2 tsp sugar and pumpkin pie spice and pulse several times until you get fine crumbs. Add the melted butter and continue to pulse several times until well combined, scraping down the sides of the bowl as needed. Pour the crust mixture into your prepared pan and use your fingers or the back of a flat spatula to press the mixture securely into place. Cover the entire bottom of the pan and slightly up the sides about 1/8 of an inch. Put the crust in the freezer to harden while you prepare the cheesecake. Add the cream cheese, white sugar and brown sugar to a food processor. Process until the mixture is smooth. Add the vanilla, pumpkin puree, heavy cream, spices, and flour. Continue to process until well blended, scraping down the sides as necessary. Add in all 3 eggs and pulse just a few times to get the eggs barely mixed in. Remove the bowl off of the power unit and lightly stir/fold the mixture just until the eggs are incorporated. Do NOT overmix. Remove the crust from the freezer and pour the filling on top, evening out the top. Cover the springform or push pan with a paper towel, then top the paper towel with a piece of aluminum foil. Fold the edges around the rim of the pan so it stays in place. Make an aluminum foil sling by taking a 30 inch piece of foil and folding it 3-4 times lengthwise. Lay the sling out and set the pan on the center of the sling. 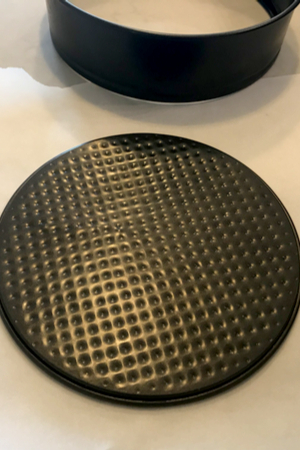 Lift the two ends up and carefully lower the pan on the trivet in the Instant Pot. Fold over the two ends of the sling on top of the pan to close and lock the lid. Set valve to the sealed position. Pressure Cook/Manual on High for 60 minutes. Holding the two ends of the sling and slowly lift the cheesecake pan out of the cooker and onto a cooling rack. Soak up any water on top of the pan by placing a paper towel on top. Leave covered for 10 minutes and then carefully remove the foil and paper towel. The center of the cheesecake should jiggle slightly when the pan is shook. If the entire pan or more than half of it jiggles, cover again and continue to pressure cook for 10 minutes with another NPR. Let the cheesecake cook for an hour on a cooling rack. Then place the cheesecake in the refrigerator for at least 4 hours before serving. Recommended garnish: whipped cream, caramel and/or chocolate sprinkles/drizzle. Be sure to use room temperature ingredients when stated. Do not overmix the eggs into the filling. Doing so will cause your cheesecake to not set up properly. Cooking times will vary depending on altitude and weather conditions. Caramel topping??? My cheesecake is in the IP coming up to pressure…..but where’s the topping recipe?